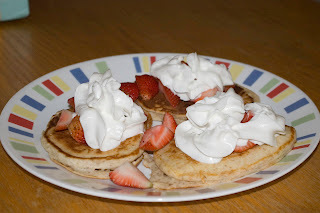 I started with Bisquick's traditional pancake recipe and took off from there. Start by mixing the flax and water in a small bowl. Set aside. In a medium mixing bowl stir together Bisquick, graham flour, and vanilla powder. Add milk and stir briskly (or use a whisk or mixer) until mixture is mostly smooth (approximately 2 minutes). Add flax/water, mixing completely. Spray preheated skillet lightly with spray oil. Pour by 1/4 cupfuls onto hot griddle. Cook until edges are dry. Turn; cook until golden.